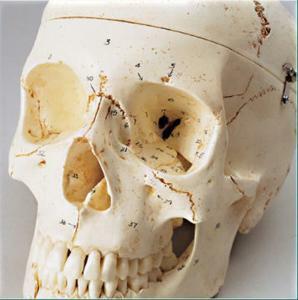 Available as a Special edition numbered skull, with a more realistic appearance, or a painted and numbered skull, these skulls have been Repli-cast from a select natural bone specimen for unparalleled realism. Every Premier Skull features individual teeth with complete roots (each in its own socket), not just a set of fused dentures like other synthetic skulls. An exclusive hinged flap in the right mandible swings open to expose the roots of the two premolars and first two molars in their sockets, plus an impacted third molar (wisdom tooth.) These five teeth are permanently anchored. All the remaining teeth in the upper and lower jaws are secured in their sockets with a permanently-flexible cement which allows you to extract teeth individually for thorough examination, and then reinsert them. Once replaced in their sockets, teeth will not fall out. This unprecedented extraction procedure can be repeated time and again. 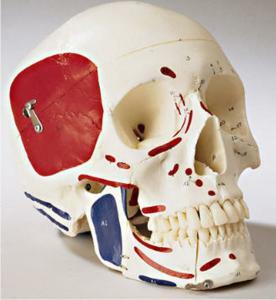 Detachable springs permit natural articulation of the mandible as well as jaw removal. The sectioned calvaria detaches to access the neuro-cranium.